Lawrence Cunningham, University of Delaware alumnus and corporate authority, delivers the Chap Tyler Lecture on Warren Buffett and Berkshire-Hathaway. Lawrence Cunningham, University of Delaware alumnus and corporate authority, signs a copy of his book. 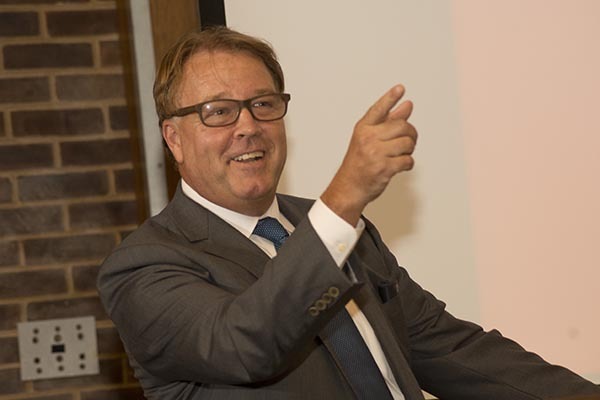 4:18 p.m., Sept. 26, 2014--Lawrence Cunningham, University of Delaware alumnus and leading authority on corporate governance and culture, spoke with UD students and faculty earlier this week as part of the Chaplin Tyler Executive Leadership Series. UD is the first stop on a 15-campus book tour for his new book, Berkshire Beyond Buffett: The Enduring Value of Values. Purnell Hall was a fitting location for the tour’s beginnings, as Cunningham took classes in the very room in which his speech was being held. “It’s a great honor to return to my alma mater. I studied across the street at Morris Library, enjoyed the great dorm life at UD and, of course, engaged in many erudite debates over beers at the Deer Park Tavern,” he joked. Cunningham also pointed out that Delaware is an ideal location because of the state’s status as the corporate capital of the United States, with half of America’s largest corporations being incorporated here. Cunningham has become a leading authority on Berkshire, the fifth largest corporation in the nation, as well as its CEO, Warren Buffett. Cunningham calls the company a microcosm of corporate America, providing an opportunity to examine virtually every topic in business, from accounting and investing to management and leadership. Since 1997 Cunningham has been the editor of a recurring volume, The Essays of Warren Buffett: Lessons for Corporate America. His new book, however, asks a new and different question. During Cunningham’s research, Buffett gave him permission to interview Berkshire’s subsidiary CEOs, directors, officers and other insiders. Cunningham said that this new book fills gaps in current knowledge of Berkshire. Although Berkshire engages in a wide variety of unrelated businesses from insurance to transportation to energy and food, Cunningham says that these opportunistic acquisitions of companies are not a weakness but a strength, as each of these companies must meet the criteria of Berkshire culture. Cunningham examined the cultures of Berkshire’s dozens of subsidiary companies, deconstructing company values and legends. He found similarities between all of the companies’ cultures that create a portrait of Berkshire as a whole conglomerate. These values, like earnestness and integrity, are cultural concepts that Cunningham argues have long-term economic value. He used the example of making the decision not to lure shaky buyers into risky loans, a decision of integrity that helped Clayton Homes to remain valuable through the housing crash of the early 2000s. 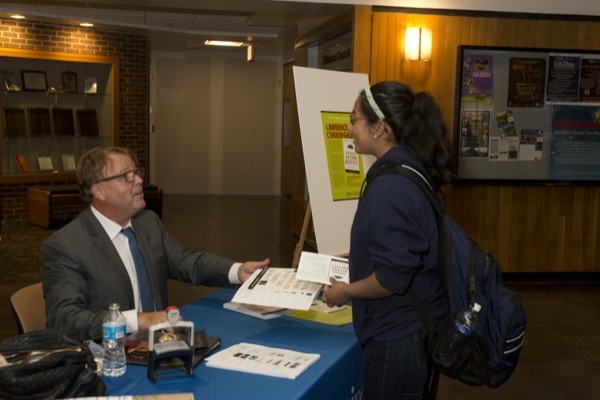 After his address, Cunningham answered questions from students and other attendees, and signed copies of his books. The Chaplin Tyler Executive Leadership Lecture Series in UD’s Alfred Lerner College of Business and Economics brings leaders from business, nonprofit organizations and the government to campus to share their experiences and insights with students, faculty and the business community in an open exchange of ideas and perspectives. Weber said that Cunningham’s work is particularly interesting because it lies at the intersection of multiple fields, such as corporate finance, corporate governance, law and accounting.